Fungal infections have increased globally due to the increment of the size of population at risk for fungal infection, which is a consequence of the increased use of immunosuppressive drugs and invasive techniques for advanced life support and extended life expectancy among other reasons. 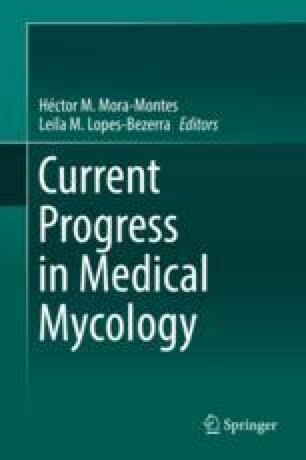 Although invasive fungal infections currently are a significant cause of mortality among critically ill patients, development and approval of new systemic antifungal drugs have not occurred at the same rate as the increase in the number of fungal infections. Only one new class of systemic antifungal drugs, Echinocandins, has been included in the antifungal armamentarium in the last 20 years. The purpose of this chapter is to review the systemic antifungal drugs currently in use, including new insights on pharmacologic and pharmacokinetics properties, clinical indications, adverse events, and resistance mechanisms. Resistance to antifungal drugs is particularly important because it has increased for every drug, including the echinocandins class. New formulations of triazol drugs and combination therapy is also highlighted.